We have moved the Bags of Blessing assembly line to the older elementary Sunday school class upstairs in the education wing. The students in this class will help with putting together the bags for food insecure children in our area schools. The bags are distributed by teachers to students to ensure that they have plenty to eat over the weekend. Thank you for your help in collecting food for this part of our food ministry. For a list of what items to donate or other info about Bags of Blessing go to this link. If you've been by the church in the past couple of weeks you may have noticed the ongoing work to replace the old chain link fence along Greenville Church Road. The Cemetery Committee has raised funds and secured the work of contractors to extend the wrought iron fence which runs along the front of the cemetery so that it continues down the road side. Special thanks to the Cemetery Committee: David Bell and Genie McDill (co-chairs), Steve Dunlap, Nancy Bell, Ralph Campbell, Carlton Higdon, and Kim Fleming. Everybody knows that Erskine is here in our community but we often forget about the opportunities it provides. Here is the list of upcoming music events. Mark your calendar and take advantage of the ones that suit your interest. You can also learn more about the Erskine music department by clicking here. 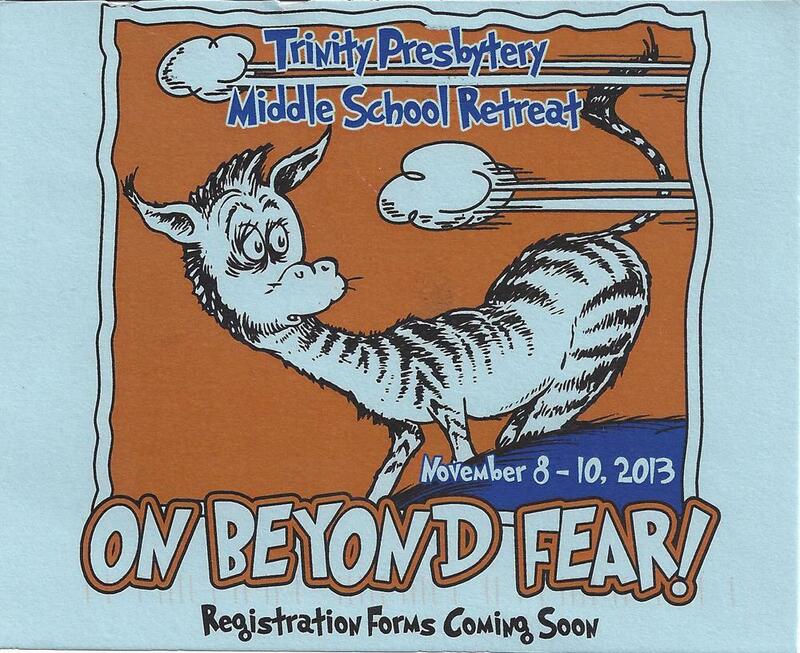 Trinity Presbytery's Middle School Retreat is set for Nov. 8 - 10 at Blue Ridge Assembly in Black Mountain, NC. The theme this year is "On Beyond Fear!" The retreat is organized and executed by the presbytery youth council meaning it is by youth and for youth. Get more information here and then contact Reba Jester, David Grier, or Pastor Bowling using our website contact form about signing up . Join us on the following Monday evenings as Father Nicholas Beasley, Rector at the Episcopal Church of the Resurrection in Greenwood, presents this BBC video documentary series based on the book, Christianity: The First Three Thousand Years, by Dairmaid MacCulloch, Professor of the History of the Church at Oxford University. Programs begin at 6 p.m. and will be held in the American Veterans Auditorium at the Greenwood County Library. 1. The First Christianity Monday, September 16, 6 p.m.
2. Catholicism: The Unpredictable Rise of Rome, Monday, September 23, 6 p.m.
3. Orthodoxy: From Empire to Empire, Monday, September 30, 6 p.m.
4. Reformation: The Individual Before God, Monday, October 14, 6 p.m.
5. Protestantism: The Evangelical Explosion, Monday, October 21, 6 p.m.
6. God in the Dock, Monday, October 28, 6 p.m. Many of you may remember Nathan from last year when he came and played piano for us during worship. 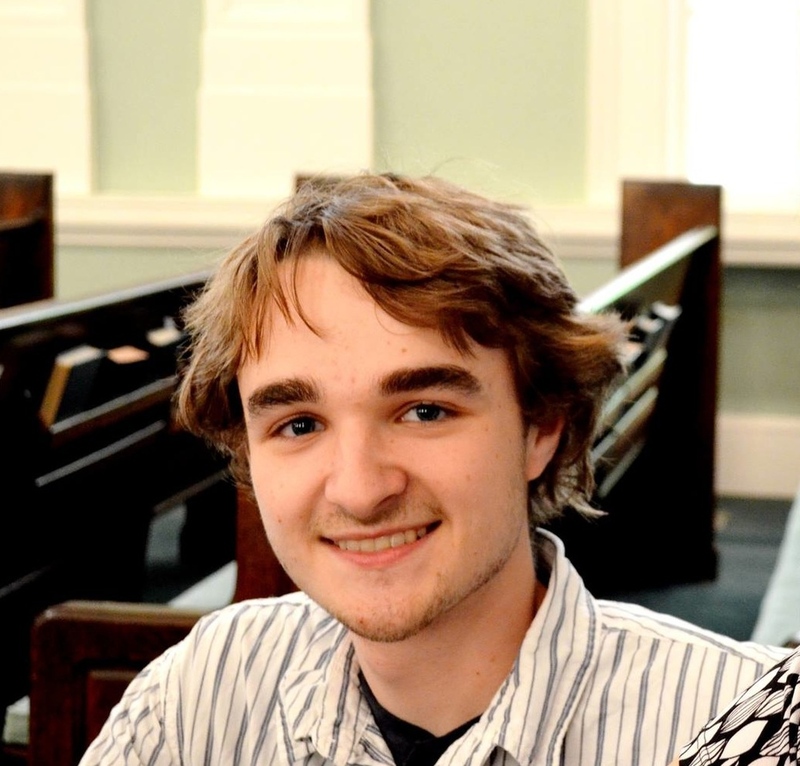 He is a student in the music program at Erskine College and was absent from us while participating in a music internship at First Presbyterian Church, Greenwood. He returns this fall semester to play when his schedule and our musician rotation permit. Please make him feel welcome. Every now and then the Manna Truck from the Golden Harvest Food Bank makes its way to Abbeville, SC, where it helps to stock the food pantry at United Christian Ministries (UCMAC). We sometimes are able to volunteer and help with the unloading and bagging of food. Golden Harvest is a food bank network that serves the Upstate and region. You can get to know about their work by visiting their website or by watching the 2min. video below. And yes, you can spare the two minutes. It's two minutes less time spent watching cat videos on YouTube, and this 2 minutes will be better for the soul. Meet Kate (Golden Harvest Food Bank) from Golden Harvest on Vimeo. On Sunday, August 25th at 10am in the Fellowship Hall our Adult Education time will be a presentation by the leaders of United Christian Ministries of Abbeville County (UCMAC). They will share information with us about their ongoing work providing food, crisis assistance, and medical care for those in need in our area. Please come and support them by hearing about their work...which is also our work as a partner congregation of UCMAC. To learn more about UCMAC go to their website. Trinity Presbytery Senior Adult Retreat will be held September 20-22, 2013 at Fellowship Camp and Conference Center. This year's theme is "Jesus Christ is Risen Today: Words of Power and Hope for These Challenging 21st Century Days and Times." Click to download a flyer with information about leaders for this popular event, schedule, and costs. Click HERE to go to registration and payment page. Support United Way of Greenwood and Abbeville Counties just by eating lunch out the week of August 26th! When you eat at the restaurant listed for each day below, please make sure you TELL THEM you're there for United Way, and they will donate a percentage of what you spend. It's a different restaurant each day. Click here to see the info on the United Way site, Click here to see what else United Way is up to. Are you actively involved in the life of your church, volunteering in some way? 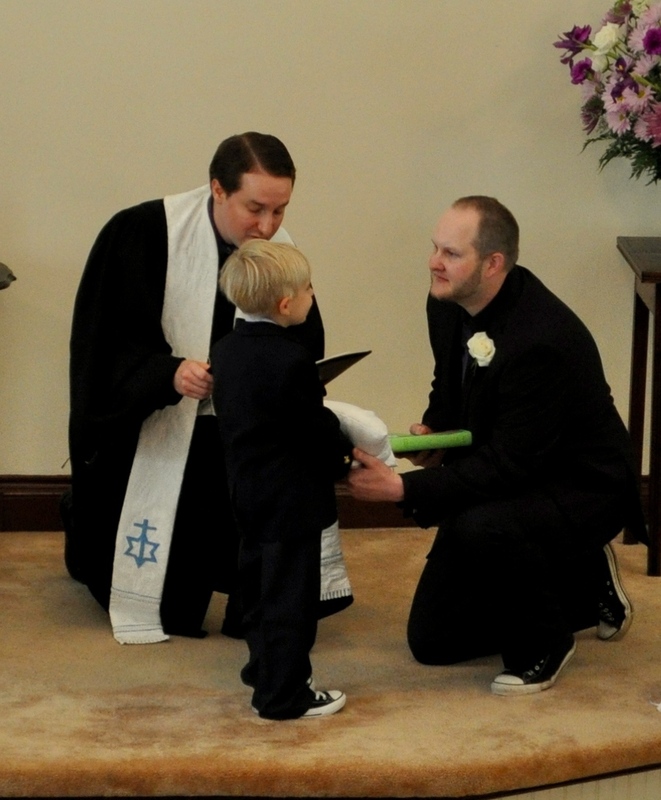 Sunday school, youth group, newsletter, committee service, or as an Elder or a Deacon? Get new ideas and training at Trinity Fest Light 2013 hosted by our presbytery's Division of Education and Nurture. There's something that could help you in your service. The event will be held on Saturday, August 24, 2013 from 8:30 a.m. to 12:30 p.m. at Seven Oaks Presbyterian Church in Columbia (See below for church address and phone number). Participants can take two classes. FREE childcare for registered participants. Please email Kevin Cartee with names and ages no later than Thursday, August 22nd. Click here to download the flyer with more detailed info and description of classes. Click here for easy, online registration through Trinity Presbytery! TEACHING & WORKING WITH YOUTH by Rev. Kevin Cartee, Executive Director for Outdoor Ministries in Trinity Presbytery at the Fellowship Camp and Conference Center. $25 if you register in advance. $30 at the door the day of the event. 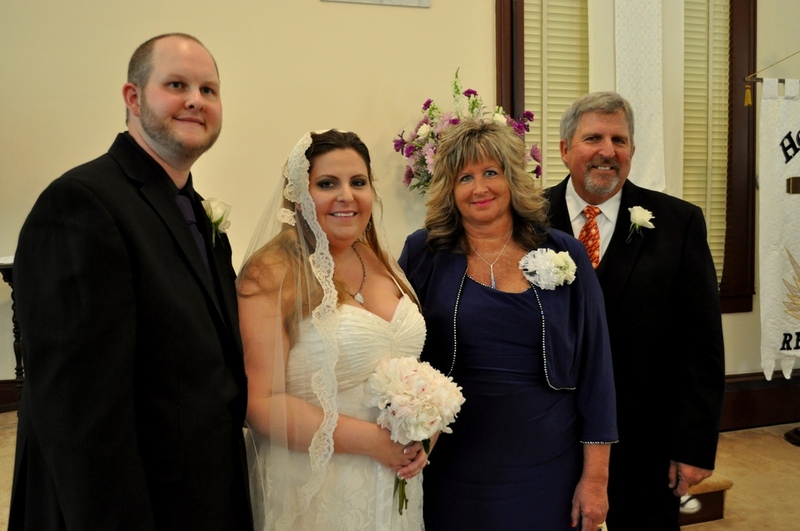 On July 22, 2013, Bill Hannah, Clerk of Session at First Presbyterian Church Monterey, CA, came to visit us. 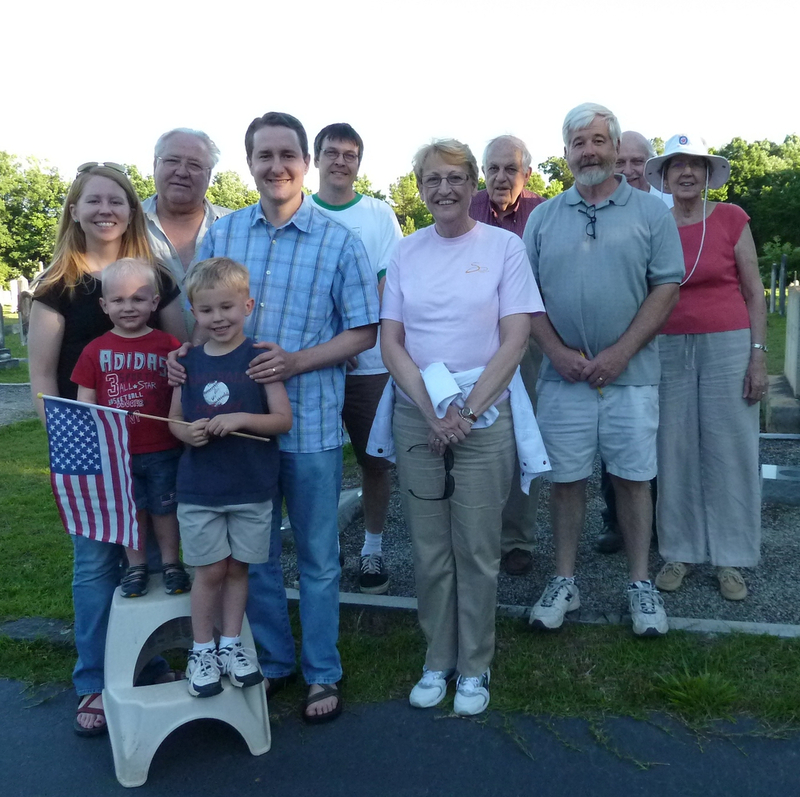 Bill's great-grandfather is David P. Hannah who is buried in our cemetery as well as others from his family. Bill had a good visit and viewed the cemetery and the interior of the church with Cemetery Committee co-chair David Bell. The Rabbit Ears Listening Library includes several great versions of stories from the Bible. The whole series is worth looking at, but these Bible stories are a great way to help children learn and hear the stories of Scripture. They are available as digital downloads from Audible.com and, through the Audible.com app for Android and iPhone you can have the stories on your smartphone or iPod to let the kids listen in the car. Here is a list of the stories available with links. You can purchase them through Audible.com or Amazon.com (Audible is owned by Amazon, so you can login with you Amazon info if you already have an account). The Savior is Born (Early chapters of Matthew and Luke) -- Read by Morgan Freeman. This is the story of the birth of Jesus in the form of a combination of the birth narratives of Matthew and Luke. Great to help teach children the story of Christmas. It's also available as a DVD. 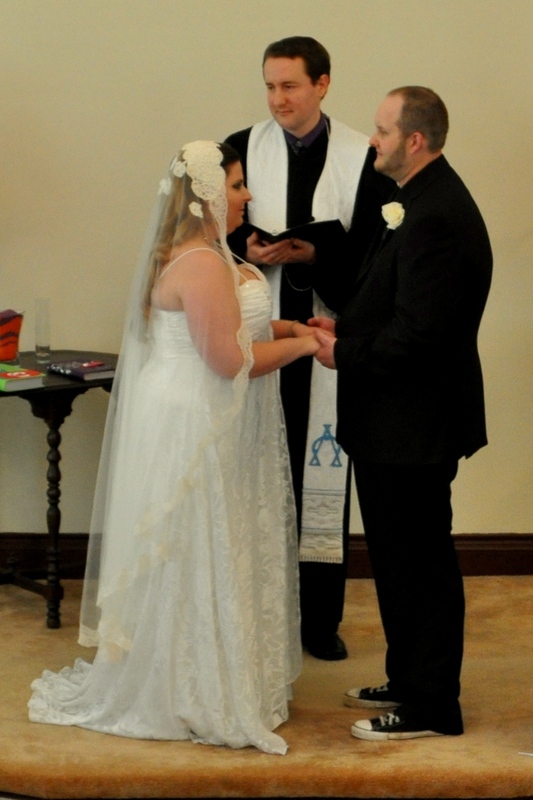 We celebrated the marriage of Jane-Marie and Jonathan at the church on May 11, 2013. 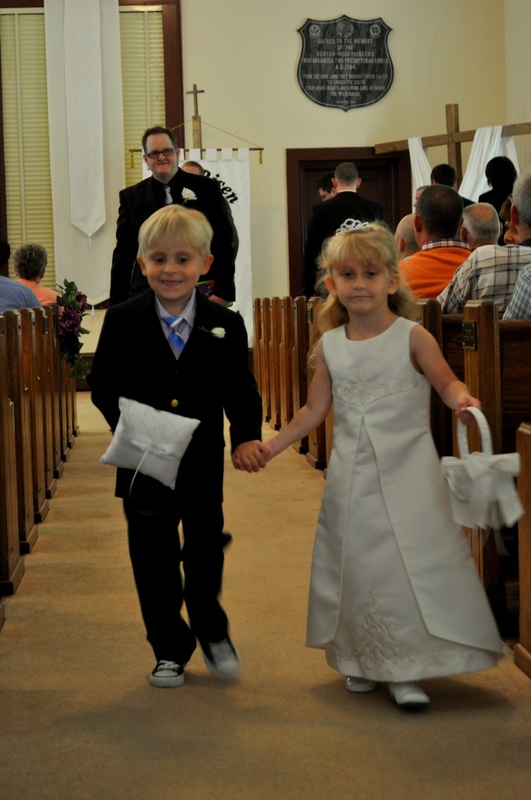 Congratulations to them and their families! Here are some photos they've shared with us. Two members of the Presbyterian Church in South Sudan, Reverend Idris Joshua Idris Nalos and Pastor Trainee David Gayin, were arrested from their homes by security forces on 19 May. They are being detained incommunicado, without access to a lawyer or their family, and are at risk of torture or other forms of ill-treatment. Please keep them in your prayers. Amnesty International is working for their release or at the very least for them to be informed of the charges against them and their families to be informed of their whereabouts. Trinity Presbytery Sudan Ministry has also been advocating for them with the U.S. State Department in Washington, DC. The Trinity Presbytery Sudan Ministry has been working in South Sudan to do medical mission trips, seminary education for pastors, and advocacy for the people of the region to the U.S. government. Click this link to see the full news release from the Presbyterian Church USA website with instructions on how you can help advocate for the release of these ministers. 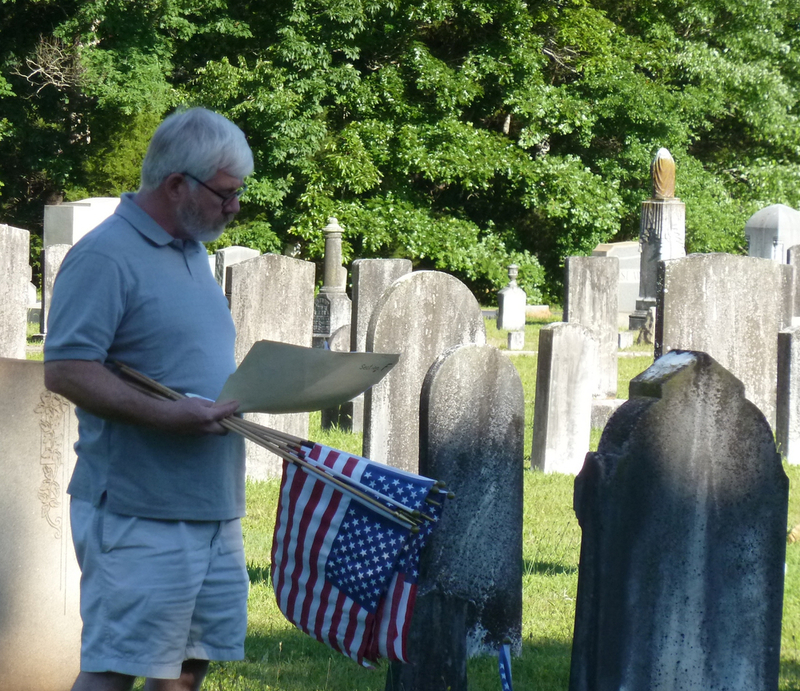 On Friday, May 24th, volunteers from the cemetery committee and congregation gathered to place American flags on the graves of all veterans buried in our cemetery for the observance of Memorial Day. 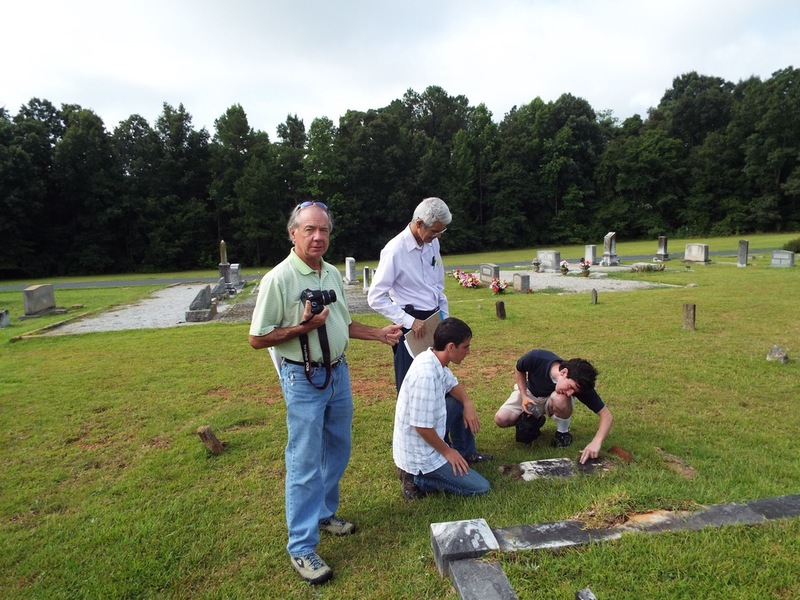 We use the records, locate the grave sites, and place the flags. When we finished we circled up and shared a prayer of thanksgiving. It was humbling to look across the site and see so many flags, so many from the church's past have served in the military at one time or another dating back to the American Revolution. Thank you, veterans, past and present. Calling all inside workers and outside workers! We need you at the church on Saturday. We have some cleaning projects and some yard work to do. Inside: we will be getting rid of the scuffs and marks in the hallways, and doing some other cleaning and moving things around. Outside: The main task before us for this church workday is to get all of the unwanted vines and sapling trees out of the bushes around the church. There are also several oak trees trying to get established at the base of our large magnolia. We also need to pressure wash some spots. Here is a list of items we need. Bring them along if you have them. On Sunday, May 19th, the children participated in a laying on of hands and prayer for our member, Jeanie Curry, who will be traveling to Brazil on a medical mission trip. She will be working with a group of doctors who will be working out of a boat along a river. They will also bring supplies and work with an orphanage where locals bring unwanted children. Please pray for Jeanie and her companions and the ongoing work of the Kingdom in Brazil. You can read more about what Jeanie will be doing by clicking here. Some of the Sunday School children found this kitten on our campus, he was sick with an eye infection and a stomach malady on top of being hungry. We fed him and got him to the Paws Animal Wildlife Sanctuary. 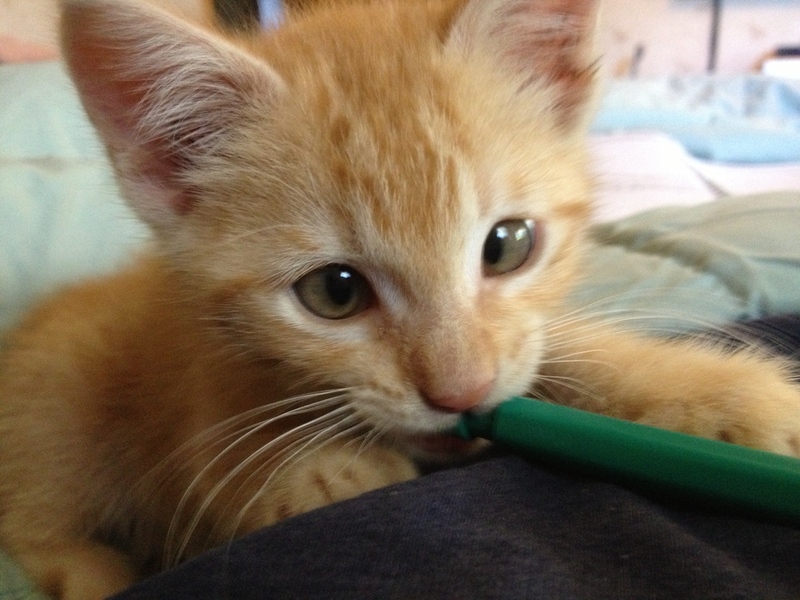 He's now settled in a home and doing much better. 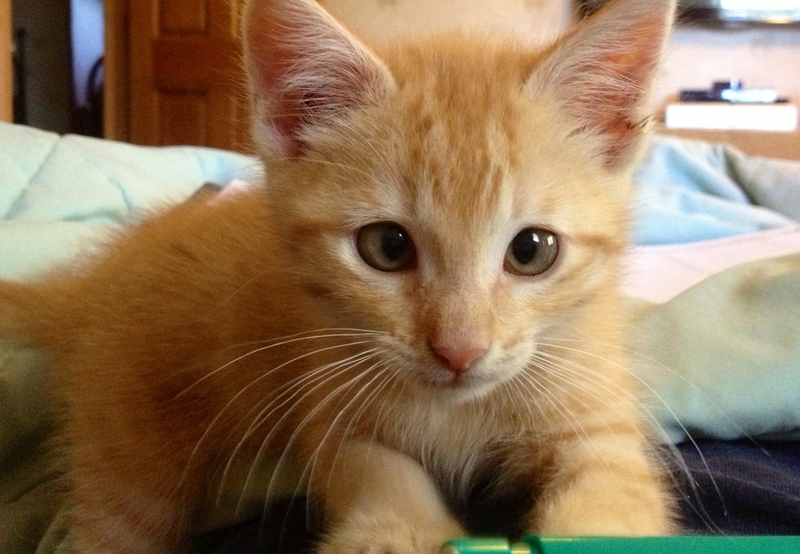 His new owners named him "Spitfire," and since he was found at the church they added "Saint." One of our members also graciously donated the cost of having Spitfire neutered to Paws. 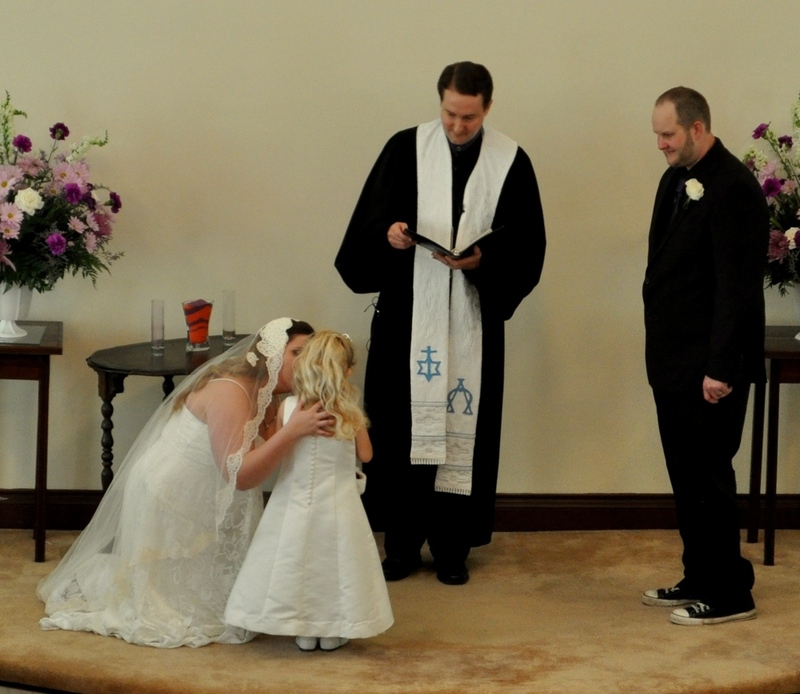 Thank you everyone who helped embody our values of stewardship of God's creatures! And thank you Paws! Members from our Presbyterian Women's group helped unpack a Manna food truck benefitting the food pantry of United Christian Ministries of Abbeville County (UCMAC). 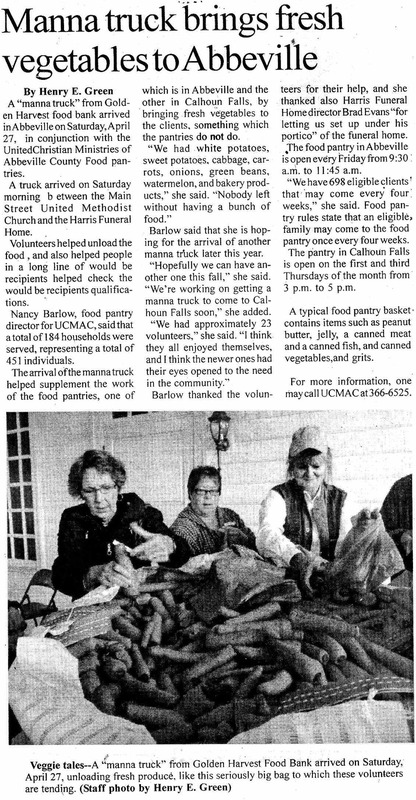 Judy Lowry is pictured in the article below from the Abbeville Press and Banner. The truck is part of the ministry of the Golden Harvest Food Bank.